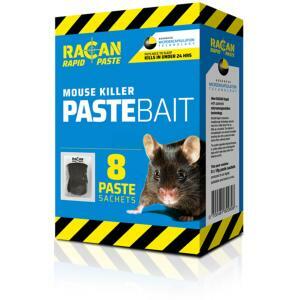 Racan Rapid Paste Bait Mouse Killer is a very new concept to the UK. This pack allows the user to refill their mouse station as and when they need to. A key attached to the side of the mouse station (not supplied) allows the user to open and place the refill sachet of paste into the corner and secure by firmly closing the lid. Simply place the bait station where there are signs of mouse activity and the mice will be lured to the station by the hazelnut attractants within the bait. Each sachet can control up to 50 mice and control can occur within minutes of bait take. Pack contains 8 x 10g paste sachets. Highly palatable and lethal to mice.